RAM Mounts RAM-Lock cradle for iPad locking dock features a unique patent pending design which enables the use of the factory iPad 3 cables with docking connector for charging as well as other functions. Also works with most aftermarket cables and or modules with docking connectors. 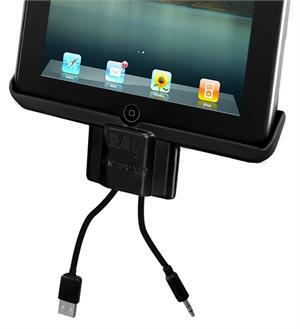 With the vast variety of available cable / docking connector accessories for the iPad 2 and 3 you can quickly dock your iPad 3 for charging, line out audio, external GPS antenna and much more. Spring loaded and equipped with a keyed lock, this compact yet durable holder won't take up a lot of space yet provides loads of security. With the new Tab-Lock™ with Uni-Conn™, RAM lets you keep your Apple iPad 3 and iPad 2 where it belongs...powered and in your possession. RAM MOUNTS universal drill-type laptop mounting system with Universal square base for all vehicles. Cradle accommodates 10"-16" wide laptops. RAM MOUNTS Marine grade aluminum base contains a 1" diameter rubber ball connected to a flat 2.5" diameter base. Pre-drilled holes, AMPS hole pattern. The RAM-B-202U will attach to any RAM composite cradle. RAM MOUNTS diamond base is 1.25" x 2.5" with a 1" rubber ball connected at right angle. Base has 2 holes 1.912" from center to center at either end of base. RAM Mounts RAM-234-6 Tough Tray II universal Netbook, iPad & Tablet Cradle Holder is a spring-loaded expandable laptop holder that can accommodate most tablets. Expands 8.56" to 12.31". 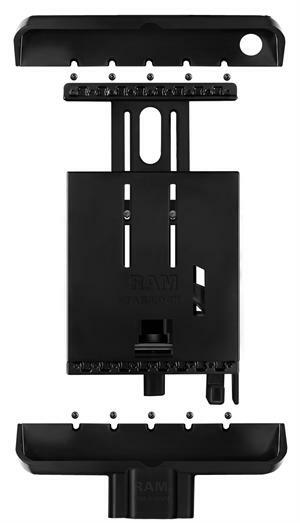 RAM Mounts Universal Tab-Tite Holder for 10" Tablets. Compatible with the iPad, TouchPad, XOOM, EEE Pad, G-Slate, Galaxy Tab & most 10" tablets. 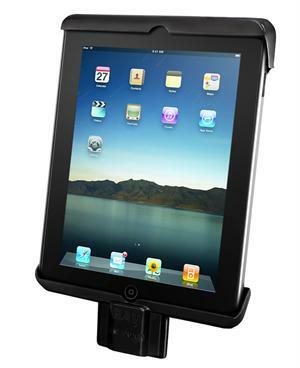 RAM Mounts Universal Tab-Lock holder vehicle mount features a lifetime warranty.